Plymouth based Air South West brought along a Dash 8 to display at the air show this year. Pilot Nick was at the helm and gave a really good display of what these commercial machines can really do! He was very brave with some of the manoeuvres he carried out. The aircraft was a credit to the company and looked very presentable amongst the classics of the air. A video of her in action is also posted below. If the video has failed then please search "Air Southwest Dash 8 at Dawlish Air Show 2010"
For a treat at the Air Show, 2 sets of Class 67s were brought down to run the shuttles between Newton Abbot and Exeter St Davids. As usual plenty of spotters were out to see them. Both sets ran 6 journeys each in the top and tail format and gave some interesting noises passing through, especially when planes were overhead. As I mentioned last week there was an interesting article in last month's 'Buses' on Mid Life Refurbishment at several different main operators. Of course Go-Ahead struck me as the interesting one to have a read about their procedure. Go Ahead say that they generally run on a 5 year cycle where buses get renovated to bring them back up to standard with the more modern buses every 5 years. The interesting part of this lies in the buses that they feel are 'worth it'. They state that they would renovate the heavy weights such as Scanias and Volvos, much like what was done with the Volvo B7 deckers that Citybus received. Of course this was actually before the Go Ahead takeover had been confirmed but this is likely what would have been seen by Go-Ahead if they had been in charge at that point. The interesting bit comes when we read further on where Go Ahead state "We don't feel its worth investing in lightweight buses like Darts". This was particularly interesting seeing as the majority of the Plymouth Citybus fleet is the Dennis Dart. Enviro 200s would also likely come under the bracket of 'Dart' as well. So what will be interesting is does that mean the Darts at PCB will simply be left in their present state and not have any renovation work done to them? It seems silly to have to replace an entire fleet of Darts because they don't feel its worth it. Maybe the policy will differ from that at Go North East but in these tough economic times maybe they will stick with this policy at PCB. True though that the Ex-Oxford Darts are going through some renovation at the moment, but who knows how long they have gone without being spruced up a bit. Having a look at First generally bus older buses receive little care and attension other than a re-paint. Mechanical work is often only done when it is really felt necessary or cost effective. 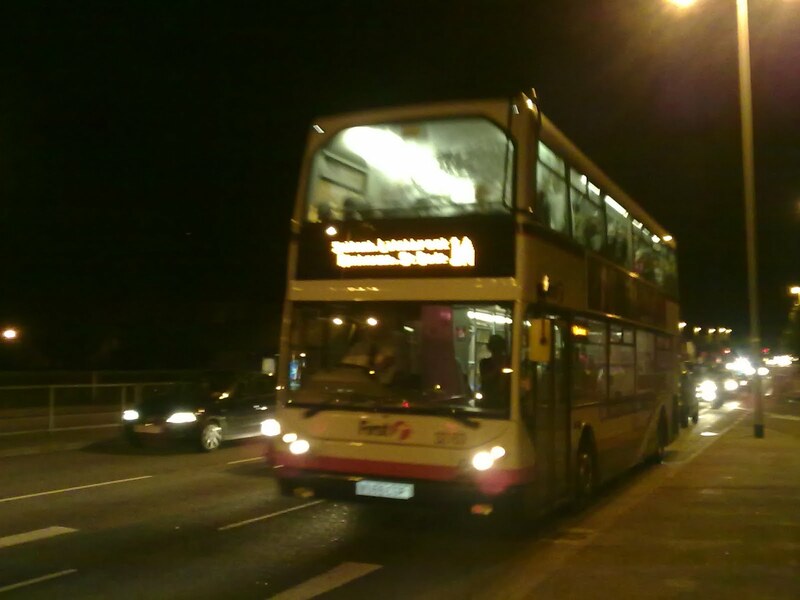 Take Torpoint's Dennis Dart S764 RNE for example. This bus has really only just finished its total transformation from standard Barbie 3. First came the re-paint. Then some new wing mirrors. An electronic blind was later fitted. And now the seats have been re-upholstered. A process that took around 5 years to complete. As for the rest of the FDC fleet other than the odd re-paint of Darts or B6s here and there, and the addition of Ugobus branding very little has changed for the buses over the years. There has never really been any mass renovation to the fleet simply what is needed is done. An interesting topic brought up and definately something that has got my mind in a muddle. Dawlish Air Show ... The mayhem! Well what can I say other than both of these incidents couldn't have had worse timing! Firstly came news from Louis Rawlings who I was travelling with upto Newton Abbot that the set of 43197 and 43031 had failed in none other than Dawlish itself leaving the whole stretch of line blocked! Of course the down line was available but with no loop section available to be used by up traffic a queue started to mount behind the stranded HST at Newton Abbot. Voyagers, HSTs and Pacers lined the platforms. 2 Cross Country services were joined together to combine into one service. The HST was turned around and sent to Penzance. The 2 local services were also joined together and the wait began. 3 hours after the incident was reported the trains were finally on their way again. Newton Abbot was at capacity as the picture shows. So we boarded one of the many trains to come down to Dawlish, but what happened next! Signal failure at Teignmouth! This therefore meant all lights were set to red and at each point drivers had to phone Exeter signal box to let them know they needed to pass. This had to be done for all the trains trying to use the line and it really slowed up the mass movement of trains on the up section. So some 4 hours after we'd actually set off from Plymouth we did arrive in Dawlish! Luckily, this was still before the show got under way! 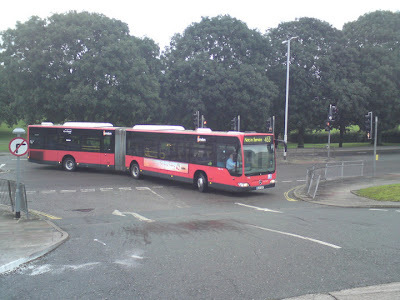 With big thanks to Dan Marker I can bring you these exclusive photos of the Mecedes Citaro G 'Bendy Bus' arriving at Milehouse depot yesterday evening. Mike was there egerly awaiting the arrival at 2044 yesterday evening. The Citaro is London General (of course part of the Go-Ahead group) with fleet number MAL112, registration BL57 OXP. The bus will now take on some driver training before being trialled on routes in the city. It will be very interesting to see how Plymouth handles these beasts. As to which routes it will be on I honestly don't know, but routes such as the 43 seem logical with no real 'difficult' corners on the route. Unfortunately I won't be able to have a ride on one because of my absence from the country, so if anyone does have a ride on it feel free to write a guest post for the blog which I can publish on my return. With thanks to Jamie Limb I have been informed that the bus will be trialled on The George Park and Ride (PR1) tonight, and then should be out on 21s tomorrow. Snap on Sunday this week was taken at a well recognised spotting location up at Dawlish. This was taken on the air show day. I used the same location to look the the planes as well which was ideal. It also gave a very interesting view of the thousands that lined the sea front to watch along with being able to spot the various traction operating that day. 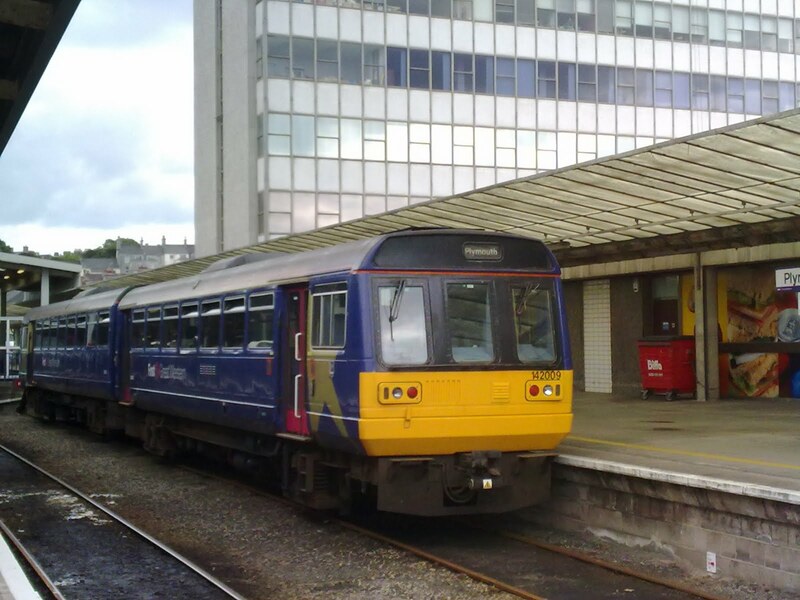 Here we can see a Pacer with a Class 150 as well as a 67 in the station. The Pacers are due to start being withdrawn in September with more 150s on the rain, so snap them while you can! Well the Dawlish Air Show always throws up some interesting news. This can incorporate 3 transport types. Of course planes, but also trains and buses/coaches in the area. So that's why I shall start this drip feed of stories by posting this photo of Class 159, 159003. No this is not a photo last year. In fact this was a FGW hire in for extra capacity. The 159 was operating Paignton to Cardiff Central. This is usually operated by a Class 67 set but 2 were being used on the Newton Abbot to Exeter shuttle services. So the 159 was borrowed to run this service. I must admit its strange how I missed seeing these around East of Exeter and was actually quite a treat to see it operating again, albeit for just one day. Further news as well as other stories will start to be drip fed to you likely on a 2 day basis from Monday onwards. I'm off on holiday for 10 days so I'll write some stories in advanced and fingers crossed they should publish themselves automatically over the 10 days. With thanks to David Sheppard and Nigel Dennis I can tell you that the now dis-used depot at Ilfracombe situated next to the bus station caught fire this afternoon around 6pm. It is thought to be an arrsonist attack in which there has been a string of events over the past weeks and months in the area. Naturally the surrounding area was cornered off because of several hazardous materials and liquids that may have been left in the depot after closeur. Of course many of you will remember the final day when OTA 290G travelled up to work some the last serve ices from the depot before the operations transferred to Barnstaple. The building was then simply left in a fairly original state. The whole complex has been crying out for renovation so maybe this may kick start the process. Such a shame though to see a true Western National building detroyed in such a brutal and thoughtless manner. Now who's bright idea was this? The whole bay is/used to be completely designated as a bus turning bay. Though since the bay was re-tarmacted a lot has changed for the worse. Benches have been put up in arquard places reducing the bay by about 20% in size meaning that a Trident has to undertake a reversing monoveur to do a 180 degree turn. These plant pots have now been stupidly places across a good 25% if not more of the space left. It is not un-common for 2 if not 3 buses to use at the bay at once and its causing havoc at peak times. First and A-Line often group together at the bay. In the mornings the Volvo B10M coach has to share the bay with a Trident, this will cause major problems when the schools start. Touring coaches also use the bay and this really did cause problems for A-Line and First on their first day of being placed there. Why this wasn't re-marked as a bus bay I really don't know, but when the 'casual parkers' end up parking in some silly place, god know whats going to happen! With thanks to Mike Hudson I've been updated on the situation that two of the buses are in that were and still are parked at the side of Milehouse Depot. As to B176 VDV the group had been hoping to save her. The deal was to have a swap with an Atlantean to raise the funds though Go-Ahead have reportedly hiked up the price of the bus to a leave that means it wasn't possible for the group to save her in their current financial state. Someone else may be able to take her on if the time is right. If not hopefully Go Ahead will hang on a bit longer until someone is able to step in and buy her. In further preservation news Mike is currently thinking about preserving DAC Coaches Mercedes 709 J205 KTT. This was once owned by Souther National as well as Plymouth Citybus at one point. Very few 709s have made it into preservation so far so this would be very nice to see if this can happen in the future. Volvo Olympian L816 CFJ has been on a bit of a holiday today operating Ugobus 3 to Barne Barton. 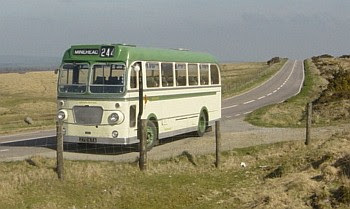 This bus worked in Barnstaple for much of its life but has now worked its way down to be based in Cornwall. Though today she was at work in the city to the suprise of some passengers on the 3. Of note 2 mum's with pushchairs flagged the Olympian down and then told the driver to carry on because they wanted a low floor bus. Of course its not the norm I suppose and is not what they expect. But surely its worth folding up a pushchair for a ride on a quality vehicle! Of course PCB are using their Volvo deckers on their Barne Barton service now. Maybe FDC were trying to copy them! Snap On Sunday: C413 HJN LIVES ON! This was written on the 13th June 2010 so great news that she is still at work giving great service. Of course I have reported on here before that she had been sold to a Dance Troupe but this gives us a much better foundation on which to track her down in the future. As to C412 HJN her fate is still not totally clear, though it does make it much more likely that she was indeed sold onto another Dance Troupe in Crewe. No doubt many of you will have seen, or at least heard the fireworks over Plymouth on Tuesday and Wednesday of this week. Of course there is mass movement of people after the event which always causes some drama. This was the first year I've witnessed what happens on the Plymouth side. Usually I view the show from Mount Edgcumbe, but this year travelled into Plymouth for a change. PCB strangely seemed to be running mostly 'standard' vehicles you would expect to see on the routes. Shockingly there was even a Mini Dart on the 8 to Laira that I saw, but was then followed on a 9 by a Volvo B7 decker. Certain workings of the 43 were also in the hands of a Volvo, but all other routes seemed to use the standard Dart or Citaro working. I must admit I was hoping to see some more interesting vehicles e.g. Volvo Citybus'. But I suppose with the poorer frequency at that time of the day they can't afford to leave people at the bus stop waiting for something low floor to come along. First had 4 deckers lined up for the Park and Rides straight after the event. This included a mix of Enviros and Tridents all working hard to deliver the masses. Several simply operated dead trips back into Royal Parade so to not waste any time. Other routes were mainly covered by other Tridents. The 1A service that I used had X80 liveried Trident 32763 on, with the chief driver trainer none the less at the wheel. The Trident was packed but I don't think the service left anyone behind. All in all an interesting experience. Very slow traffic when coming away from the town though as you would expect. As to whether I'd do it again, I think I'll just stick to the much calmer Cornish side! Again we will have a look at the fleet changes going on at Plymouth Citybus at the moment. Generally the side of the depot is reserved for the new arrivals waiting to be preped and put into service. Or simply ones that need to be ready to get got out quickly. But over the past week it seems to be looking more like a death row, with many of the older vehicles occupying the space. Generally these vehicles are kept out of the public eye seeing as several are withdrawn, but it makes it much more interesting for us. We shall start with one of the faithful old Volvo Citybus' that are starting to fade away from PCB. Indeed F606GVO and 179 G612OTV were noted on trade plates 'Presumably leaving Plymouth for the last time'. No doubt that G623 OTV will be meeting a similar fate in the not too distant future. Real shame that these fine vehicles will be disappearing from the scene. Next I shall go onto a bus I didn't even think existed any more. But this is B176 VDV out in all her glory in a very much withdrawn state. With no blinds inserted any more she has no hope of returning to service. It would be a real shame to see this one go after the 24 years of loyal and dependable service that this bus gave. From front line coach work to school contracts, from private hire to core route work, this bus has done it all. Would be really nice if the Plymouth City Transport group could acquire this one, or any other private preservationist. Next - even though its in quite a withdrawn state, R402 FFC is one of the newbies to Citybus. This one looks next in line for the PCB makeover to join 2 sister Darts from Oxford to replace the step entrance Darts before the year ends. There were also plenty of Mercedes 709s on show with 4 along the side of the depot today. Some were in a more withdrawn state than others, but very few will likely be returning to service. Hopefully someone may also get their hands on one of these. Some may call them revolutionary, others simply call them a pain, but love them or hate them the minibus era transformed the way services are run today. Lastly was this Dart. With research K409 FHJ is/was part of B-Line of Barnsley. The latest photos I could find were taken by Ben Morroll in 2008 so where its been for the past 2 years I really don't know, but that might be the key to why its at PCB. Its been around for the last 3 weeks now though with no movement so we shall see what happens with that. David Sheppard has now started a new blog documenting the past, present and future of his acquisition since November, 270 KTA. The restoration has been up and down so far to say the least, but don't take my word for it, do go and look at this excellent series, it will be well worth you're while. Fortunately while 'Shep' has the gift of the gab, he also he is also a keyboard tapping tycoon! So keep watching. Hello hello I am back in action. Apologies for the gap in posting but I haven't really been in the house long enough this week to get time to write a blog. So lets do a bit of a catchup! Firstly I shall start with this photo of a soon to emerge newcomer to the city. This is one of the Ex-Oxford Dennis Darts recently brought down to start to replace the high floor L and M reg Darts at Plymouth Citybus. As you can see R408 FFC is nearing completion and hopefully will move into a bit location to get a better photo. It looks pretty much ready apart from the rear lights yet to be fitted. But that's just the back at the moment. Who knows what really might be going on. On the subject of this there was an interesting story in this months 'Buses' magazine about mid life renovation that I may touch on soon! Will be interesting to see what these 12 year old Darts are made of though. Snap on Sunday - Mevva! Today I took my first trip down to Mevagissey aboard a vehicle I haven't ridden on for a long white. More specifically this was an FDC Mercedes Vario, this being S557 RWP. It must be some 4 years since I last rode on the vehicle when it was on short term loan from Plymouth depot to Torpoint while one of the Varios wasn't available. Actually ignore me on that one. Last time I rode on it was on the 39 in fact! Sorry I really do write this as I go along. That would have been sometime in 2008 where I rode on it as far as Derriford if memory serves me. I would delve into the archives for a photo but they still aren't available to me! 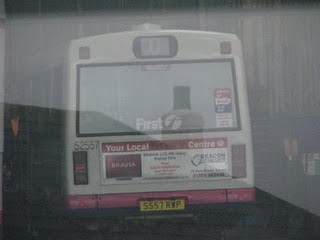 Here though I do have a - well terrible photo of the bus during 2006 when at Torpoint. 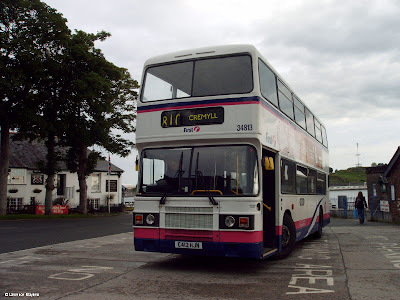 I only have this because I did a blog on this bus at Torpoint a long while ago. The Vario does seem to have lost its 'umph' since I last rode on it. Still it did bring back memories and was a nice change to a Solo. That's right, the photo does indeed show a Class 142 in the bay Platform at Plymouth station today. The unit in question was 142009. This was taken around 4ish. I couldn't tell you what this would have been used on if I'm honest. Of course it would be some service from Exeter to Plymouth, but why it was used I really don't know! Especially with the recent influx of extra 150s it does seem quite strange. Though no doubt this would have been an interesting trip up Rattery Bank and the various other inclines between Totnes and Plymouth, a real challenge for the 142! 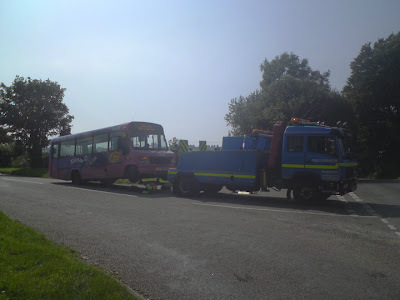 One of FDC's drivers has recently sent me a few photos of various buses he's broken down in over the years to me. 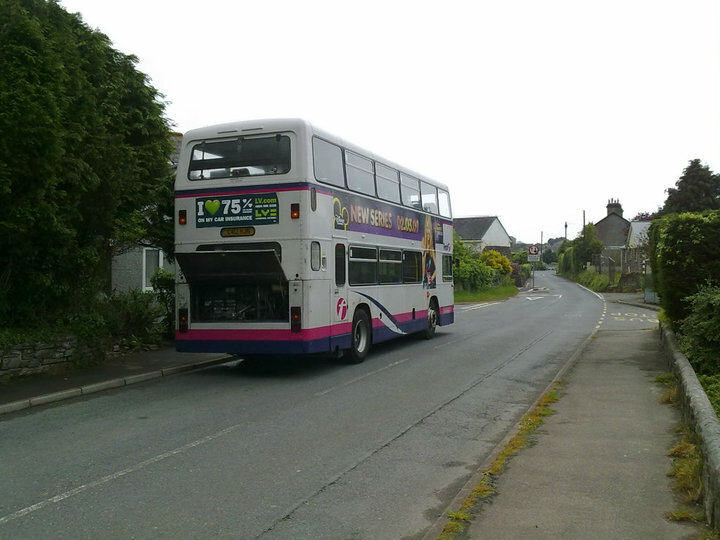 The first one here was only taken this week and shows K804 ORL in Millbrook. He said the mechanic had tried his hardest to get her going again but in the end, they had to resort to calling out FS Recovery from Plymouth. You may recognise the truck in that this is the same one that towed sister Olympian, K801 ORL through Plymouth last year which I posted on. Here we have a breakdown from the past. This time its Mercedes Vario 50301 or S407 GUB as you may prefer to call her. This was the only Vario from Torpoint that didn't pass into preservation and indeed was sold on and was believe to be scrapped. From the look of the photo this looks like it may have been operating a 181, though could well have been somewhere on the 81A (now the 81B). And lastly here we have C412 HJN seen here in Crafthole after developing a water leak. If I remember rightly this was actually bodged using an incorrect pipe from another model of bus until a proper one could be sourced! Indeed to prove the point K802 ORL was actually seen out working 3s yesterday. Though this is unusual this is actually correct. K801 was indeed working Torpoint journeys that day. 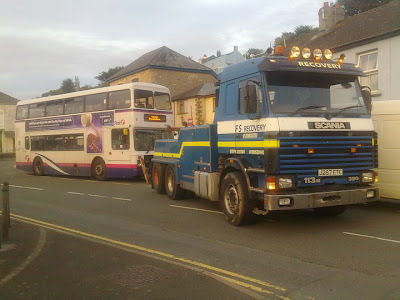 As to Tavistock's allocation of K803 I've personally never seen her out on Tavi routes. But indeed I have seen K804 on 93s on the odd occasion. 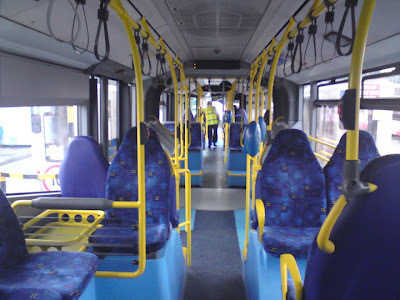 Talking of the 93 an Optare Solo was operating it yesterday in place of the normal Trident. I presume this was one that is usually used to operate the Dartmouth town service, but had escaped onto the 93 due to a bus shortage. It does make sense in some ways seeing that on on the so called 'Bus Graph' only one Olympian is needed for daily operation at Torpoint. Though that does mean that all 3 Darts and 5 Tridents also have to be avalible to work on that given day. True though that 32762 joins the 5 original Tridents for Torpoint leaving a spare Trident, though is generally allocated to Plymouth for X80 workings. Amazing what you can find in the 'small print'. It was hoped/rumoured that the driver training exercise from Wales through to Paignton and Plymouth today would be a DRS Class 37 locomotive. Pretty rare to see in working condition these days so there were a few spotters out and about today eagerly awaiting the arrival. Unfortunately though what actually turned up was this rather un-inspiring American Class 66, famed for the 'Yinging' noises it makes while ideling. Indeed it did plenty of that but none of the raw power any of us were hoping for. The Cardiff to Paignton service was also seen today with its allocation of Class 67s these being 017 and 029. Strangely passengers still seemed confused boarding this service when they're used to seeing a Pacer or 150 on the service! Some actually were so confused that they did end up waiting for the proceeding service! Tamar Cruising have now started operating a new route this year. 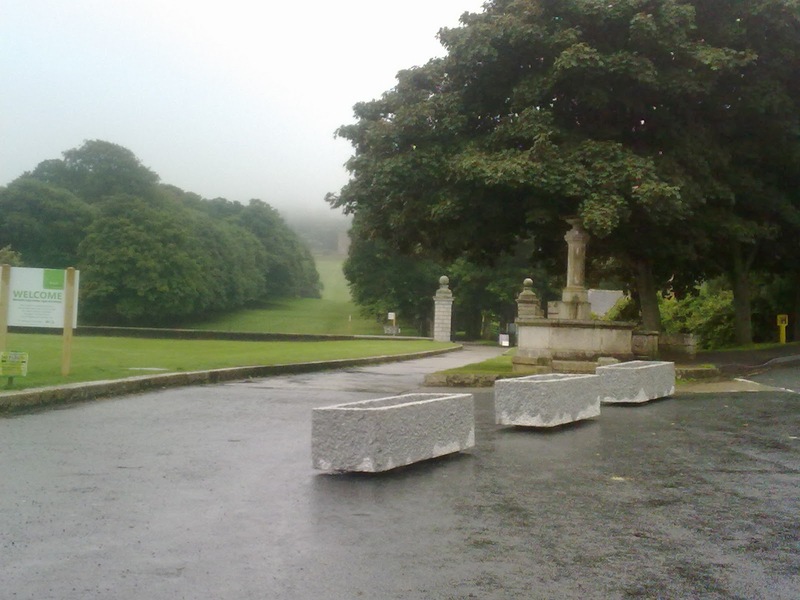 The route starts from Cremyll (referred to as Mount Edgcumbe) and goes out of the mouth of the river upto Mount Batten. This is a 5 times daily trip mainly for tourists wanting to visit the park. This is a summer only service which will cease on the 30th September. It will be interesting to see how popular the route will be. I presume that the Tamar Belle is operating the trips, unless the Plymouth Sound extends its trips on route into the Barbican. In this post I'm concentrating on this lovely old AEC open topper rather than the American school bus style BMC to the left of the photo. These are of course both Liskeard and District vehicles. I heard a very interesting comment that Cremyll Cabs/Coaches were at one point looking to buy the AEC for use on a Whitsand Bay tour type service along the twisting roads of the Rame Peninsula. I, and many others have always thought the Rame Peninsula would be a prime place to operate an open top service in the summer. The question would be where from! A realistic suggestion would possibly be making certain journeys of the 81C open top. but of course 81C now covers a fair amount of urban driving. Its also not your 'short hop' type open top services that are 'Oh so popular' in many cities across the country. So that knocks this out. There would be little catchment running it from Torpoint. The only other place therefore would be from the Tregantle Fort car park, but then would seem a fairly short dash along the cliff and back, with little market? Its an interesting thought but I do wonder if people would use it. I suppose starting off with something similar to the AEC to experience loadings would be good. A double decker could then be brought in, if the service was to prove popular enough. As to who would end up running it, well I doubt First would bother with something like that in their campaign to cut down to the core routes in the area. The operation doesn't really suit A-Line in that generally A-Line doesn't operate at all on weekends. Cremyll Coaches therefore seems the one left even though generally they specialise on private hire and wedding work with some contracted services. As to the vehicle choice though the AEC may be an eye-catching vehicle, as was pointed out it would be a pretty hard job doing many runs in this a day along Whitsand Bay. 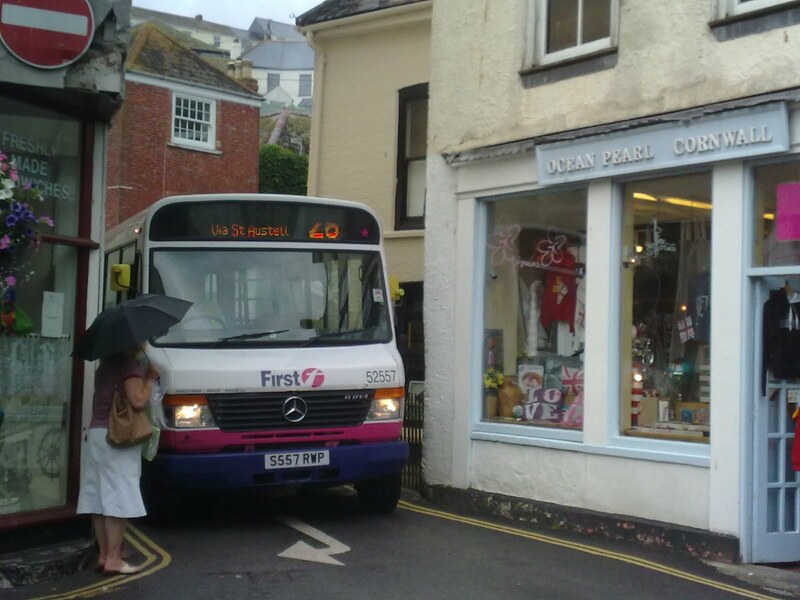 Even Dart MPDs run into trouble along Whitsands with traffic and badly parked cars. With the crash gearbox things could only be made harder along this stretch and an 'easier' vehicle would likely be needed. Of course 'back in the day' all sorts would have operated the route, but with 'bigger' and more cars on the road these days, it would make the task all that much harder. So an interesting prospect still, but I doubt we'll be seeing it start anytime soon...unless someone decides to chop the roof off a Dart?